Chinese New Year has come again and the year of the Horse shall be celebrated with full of energy among family and friends. Celebrate we did as we gathered at The Emperor Chinese Restaurant, Dorsett Grand Subang to indulge in their extensive and authentic Cantonese cuisine. There are choices of special delicacies from Emperor’s various set menus, traditional Yee Sang, dim sum feast and chef recommendations of A la carte dishes, specially catered until 14 February 2014 for their Emperor’s Reunion Meal promotions. We had one of their set which is the Goodwill set. Priced at RM1388++ per table of 8-10 persons, there are 9 dishes including desserts and the Yee Sang. 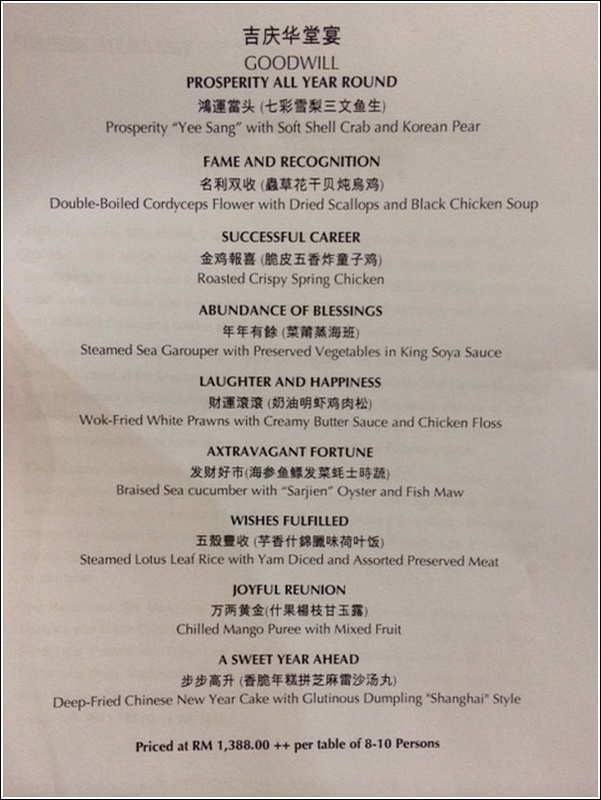 I love how they name their dishes to revolve around prosperity all year round. Other than the Yee Sang with Salmon, diners can opt for the ala-carte menu where there is a choice of Yee Sang with the Jelly Fish and Fresh Fruity, Salmon Fish and Crispy Fish Fritters, choices of Korean pear with either Salmon, Crispy Shell Soft Crab or Sliced Abalone, which is available for ala- carte order in half portion or full portion starting at RM48.00++ onwards. This is the second time we had this roasted crispy spring chicken as we love it to bits! The first time was during our mooncake dinner here last year. Tender meat beneath those crispy skin, it is easily Ethan’s favourite. He polished his portion in no time! Remember we are having a Cantonese cuisine and in Cantonese, prawns rhymes with laughter. I had a lot of laugh trying to peel this with a baby in hand. I failed. In the end, Darling peeled everything for me and I just eat like queen :D I love the chicken floss. Though I find it unnecessary but it is a nice touch as it brought back nostalgic feelings having this. Somehow chicken floss always reminds me of good CNY memories. My favourite dish at any Chinese dinner is the braised sea cucumber dish. Need I say more? It’s the collagen! Having it braised with fish maw and oyster is just perfect! Rice. Reminds me of my thought of having white rice to go with the steamed fish earlier but I did not as I was watching my diet. Guess what? I had this instead! It’s okay, it’s a ‘once a year’ thingy right? Furthermore, it has a nice aroma to it as it is served wrapped in lotus leaf. Who can resist? I always look forward to having this chilled mango puree with mixed fruit since the first time I had it last year. The thick mango puree makes a nice ending to a delicious meal. Nian gao, another must-have to welcome the Chinese New Year of the Horse. During the Chinese New Year period (31 January till 14 February 2014), there’s also a Dim Sum promotion in The Emperor where you can order their large variety of mouth-watering dim sum from the a la carte Lunch Menu. For enquiries or reservations, please call 03-5031-6060 ext.1954. Saw this event in Isaac’s blog. Btw, the good luck comes form the tossing of the yee sang, right? So you were busy taking photographs, didn’t get to toss…no luck lah? Muahahahahaha!!!! !